It all started as a joke a few days before Christmas. Well, in all honesty it started my first year here when I opted to learn the 2200 basic kanji. Kanji, for those unaware, are the Chinese pictographs that Japanese has adopted from Chinese. Japan uses about 2200 of them and throws in two syllabic alphabets to round out the grammar. Occasionally a more obscure kanji will pop up in a name, but for the most part it is just those 2200. Before I began my time in Japan I sensed that learning of kanji was something I wanted to pursue. The Chinese pictographs have always fascinated me, but I’d never had an excuse to devote the necessary time to learning them. The way I think, the way I pray, the way I hear from God often manifests as pictures and analogies, and the intricate pictures formed by this alphabet were something that appealed to a deep part of both my brain and my heart. I twiddled around with a book for awhile, and then found a program to dive into. 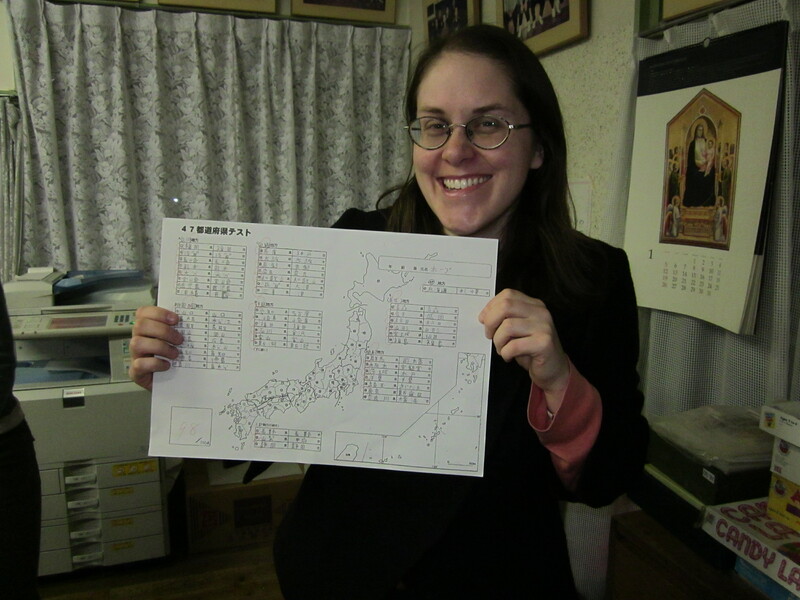 Learning the 2200 kanji took me about seven months. I know a person who did it faster, and I know a person who did it slower. But for the most part, I know people who either started and then gave up around 700 or who never even tried. Completing that program is something I am immensely proud of. In some ways I’m more proud of it than my high school, college, or master’s degrees, for I never doubted I could finish those and there were many, many days when I wasn’t sure I could complete this program. Nevertheless, that program ended 11.5 months ago. Since then I haven’t been reviewing the words consistently. I’ve poured my time and energy into learning other aspects of the Japanese language. A lot of the kanji I can’t come up with a meaning for just by looking at, but they are all in there somewhere, and that is relevant to what happened next. A few days before Christmas I was reviewing the computer flashcards that contain the kanji. That day the word for “lagoon” popped up. I missed it and was dutifully sketching out the character so that I would remember it when it cycled back around in a few minutes. The Japanese English teacher whose desk is next to mine saw me sketching. So a moderately surprised Tami-sensei asked the social studies teacher if there were any extra copies. They both glanced at me. There was a little admiration and a little shock in their eyes. I didn’t care. This sounded like a wonderful challenge. It also sounded like a win-win-win situation. The past few months I’d been thinking about studying some Japanese geography. Years ago there was a question on Jeopardy!! which asked the contestants to name two of the four islands of Japan. At the time all I could say was, “Okinawa?”, and while that ignorance was permissible back then, I’d feel pretty sheepish if I lived here for three years and still couldn’t name the islands. This challenge was one greater, learning not only the island names but also the prefectures, their capitals, and the regional names (roughly equivalent to learning “mid-west” and “deep south” in the U.S. The difference is that these are official names, and the exact nuances of U.S. regions is a hotbed of contention among American citizens). What’s more, it would be an excellent kanji review. I miss studying kanji, as I find it to be incredibly fun. And even if I could only answer a few questions correctly, because most Japanese people don’t believe non-Japanese can write kanji, ANYTHING I wrote would impress them. It felt like I couldn’t lose. I studied here and there for a few days, but I opted not to take the materials home with me over Christmas. I’m not in the States all that often and I wanted to enjoy my vacation. What’s more, I knew my brain needed a break from all Japanese, even the fun stuff. Once I got back I had every intention of studying before school started up again, but a sinus infection zapped my energy and I didn’t pull out the paper until the first day of school, Wednesday, January 8th. On Thursday, January 9th I asked when the students’ were taking the test. The eighth graders, I was told, had already taken it that morning. The ninth graders would take it on Friday, and the seventh graders on Tuesday (Monday was a national holiday). To buy myself some time I asked if I could take it the same day as the seventh graders. Then I began studying in earnest. Japan has 47 prefectures. Plus the capitals, that’s 94. Six regions makes the test an even 100 points. 29 of the prefectures share their name with the capitals. In that respect, this test was easier than learning the 50 states and their capitals because none of those are identical. But, while everyone in the U.S. has grown up hearing the words, “Mississippi” and “Idaho” and “North Dakota” even if they can’t find them on a map, I hadn’t grown up hearing these names. Okay, thorough coverage of WWII in U.S. history courses means I knew Okinawa and Hiroshima and Nagasaki. Everyone knows Tokyo, and I live in the Fukushima prefecture. Since coming to Japan I’ve learned a few more names, as Aomori, Kyoto, Nara, Osaka, and Sendai are all places I’ve visited. Other names I know because family names often mirror prefecture names. Miyazaki, a famous film maker, shares his name with a province in the south. And Miyagi (Karate Kid, anyone?) is the prefecture just north of me. Recognizing names helped a little, but not entirely. Remember, I wasn’t writing Nara, or even, なら. I was writing 奈良. I could learn the pronunciations, but if I wanted to take the same test the students did, I was going to have to learn the characters. Two problems immediately presented themselves. The first was that handwriting does not look like typing. I learned kanji from a book with clearly typed strokes in 256 point font. In contrast, I could identify some of the characters neatly penned by the social studies teacher, but not all of them. For this I turned to the Internet. I found one map that listed the prefectures’ names in the English alphabet and a Wikipedia page for Prefectures of Japan that listed the English alphabet names next to the kanji. Between the two of them, I was able to figure out what I should write. The second issue is that I’d forgotten a fair amount of the kanji, or only remembered a general meaning instead of a specific one. I’m not much for memorizing an unconnected series of strokes. Kanji works in my head because each one means something. Once I figured out what the kanji looked like, I had to go back and look a lot of them up. So far I’ve told you the challenges I’ve faced in this process. What I haven’t explained is how much I enjoyed this process. This wasn’t just about personal enrichment; it was downright fun! There were 100 entries. 90 of them were composed of two kanji, 9 were of three kanji, and one does not posses a name in kanji, only in the syllabic system. Each of these combinations came together to form a picture in my head that turned into a story. One city’s name translates to “Pine Creek.” Isn’t that lovely? Japan also has “Pine Mountain,” “New Lagoon,” “Big Harbor,” and “Thousand Leaves.” For some of the kanji I utilized stories. Occasionally these were true (“Bird Catch” really is a prefecture where people initially made their living catching birds) and other times they were entirely made up. But the latter were often more fun. “Bear Origin” lends itself to all sorts of tall tales. And “Briar Castle” just begs for a Sleeping Beauty analogy. Occasionally I used prompts that only make sense to me. One prefecture is called, “Loved Beautiful Woman” and the capital, “Pine Mountain” was also the last name of the most attractive and popular teacher at my school last year. Clearly the Loved Beautiful Woman got married to Mr. Pine Mountain. I mean, that only makes sense! One of my favorite pictures was the one I associated with “Love is Known.” “Love is Known” is a prefecture whose capital translates to, “Name Old Roof.” Well, it just so happens that at my alma mater people have the option to ring a bell in an old tower to announce their engagement. Once or twice I went up to celebrate friends’ engagements and up in the eaves hundreds of couples have scribbled their names on the beams and rafters. Some names were hard to remember: “Mountain Shape” and “Three Heavy” for instance. For others I made wild presumptions. On the north central side of the main island lies three provinces. The southern one is called “Blessed Well.” The middle one is “Rock River” and has a capital of “Gold Swamp,” while the northern one is “Wealthy Mountain.” In my mind, there is gold in those mountains. That gold started in the north and trickled it’s way down a river full of rocks, got sifted out in a swamp, and finally ended up in a well. I now have an assumption that that part of the island is full of pretentious rich people, but at least I know the prefectural names. Sunday I took a break, but Saturday and Monday I spent significant stretches of time studying. I had a bad cold and didn’t really feel like going anywhere or doing anything anyway. I ran several mock tests throughout the week and watched my score steadily increase. Then it was time for the big rodeo. Tuesday morning I missed my alarm and woke up at 7, just 15 minutes before I had to be on the bus. At school we had our weekly teachers’ meeting and then I had three classes in a row. It was fourth period before I had a chance to take the test, but I knew I was ready so I just sat down and took it. Did I answer perfectly? No. I had a couple of those, “I know I know this but I can’t think of it” moments, and one capital I only came up with after some fervent prayer. Tests like this are a rush, which is both exhilarating as well as a detriment to my cognitive function. A bigger stresser for me was whether or not my handwriting was legible. I scribble kanji all of the time but since no one is required to read it it isn’t inherently legible to a Japanese person. What’s more, I’m used to writing in the 268 point font and now I had to attempt the 14. I deliberately made the strokes, but still, I wondered. I knew I had made that bottom stroke, but would the social studies teacher know? But by the end of the period it was time to turn in my sheet. The immediate feedback was positive, “Segoi,” the social studies teacher called out as I handed it to her, which roughly translated means, “Cool!” She beamed at the tiny characters. Well, at least she could read them. It was lunchtime, so the teacher put my test aside and left to eat with her homeroom. Suspense hung in the air. I immediately checked my master sheet and knew I had missed two of them. But that wasn’t awful. In the rest time after lunch, when teeth are brushed and students chat in the halls and salesmen visit the teachers’ office peddling yogurt and insurance, the social studies teacher called Tami-sensei over to her desk. It turned out I had missed four. Stupid mistakes, all of them. If I were to retake the test I could probably answer those correctly. But I might make a mistake somewhere else. All in all, I was very happy with my grade. And for some reason – maybe partial credit? – I was given a score of 98. One of the contradictions that forms my identity is that I am both extremely open and an intensely private person. I will tell a curious stranger or an interested acquaintance the deepest parts of my heart but I will also keep secrets from even my closest friends. As I left school on Tuesday, I wasn’t sure I wanted to tell anyone. I had accomplished my goal and that was enough. But after thinking about it for a little while, I decided to go ahead and mention it. About 20% of that is because this is something I am really proud of and really excited about and I wanted to share that joy with others. The other 80% is because what I did most people think is impossible. Years and years ago I read that the reason Japan whips the pants off of the U.S. when it comes to math is because of different mentalities. In the U.S. we think, “Calculus is really difficult and can only be understood by a few very smart people.” In Japan they think, “Calculus is challenging, but everyone except a few especially stupid people can master it.” I think of that analogy all of the time here, only here it relates to kanji. Most native English speakers think it is impossible to read, much less write, any more than a few of the most basic kanji. Earlier in this post I wrote that I know one person who completed the program faster than me and one who completed it slower. I didn’t misspeak. I personally only know two other people who have learned all 2200 kanji. When I first decided to learn kanji I received a lot of backlash from past and present members of my team. Sometimes I was outright told it was a foolish idea. More often I just saw the disapproving looks similar to those one gets while throwing a tantrum in a public place. I embarked on that journey and had very little support along the way. So when it came to this project, I didn’t tell people I was studying. I didn’t need people telling me not to, or making fun of me if I failed. After I succeeded, I wanted to tell them. For one day, for just a few minutes, I wanted to plant a seed within them that maybe the Japanese kanji isn’t an impossibility. If they don’t learn it, okay. But they are making a choice not to learn it, not succumbing to the inevitable. If native English speakers are skeptical, however, Japanese are even worse. They believe that as a white person I can’t write kanji, and scribbling a single one on a chalkboard has repetitively brought genuine exclamations of surprise. The seventh graders at my school knew I was studying because Tami-sensei used the information to try and motivate them. After lunch on Tuesday they eagerly asked what my score was. The presentation of my test sheet to them was met with a few congratulations and more exclamations of dismay. I don’t know what most of their scores were, but a passing grade was 80, and four of them hadn’t passed. I didn’t understand all of the chatter, but I caught enough to understand the gist, which followed the usual refrain: “But, you’re an American, and I’m a Japanese person. How can you do better than me on this test?” It’s a good question, and I don’t have answers for it. Except that I have an advantage over them because I learned all of the kanji last year, and they have yet to do so. And I’m thirty years old and have a couple of degrees. I’ve learned a few things about study skills along the way. I embraced this challenge because it was something I loved. I could have told no one and been just as delighted. But afterwards I feel like what I did became a minor protest against racism. At the bottom of my heart I hope these people whom I dearly love learn to see me as someone who isn’t stupid, and, more importantly, that they will stop viewing white people as those who can’t master Japanese. It’s a difficult language, but my failures are because I’ve only been studying the language 21 months, not because my biological heritage dictates the endeavors to be impossible. What an incredible accomplishment! I admire your drive and dedication in pursuit of this goal, and enjoyed reading about it immensely. Wow, 2200 kanji is 7 months is an amazing pace! It took me much longer to lean those and I can only write a few. Thank you! I learned by using a book called Remembering the Kanji by James Heisig and an online flashcard program called Anki. When the prompt comes up, I have to sketch the character from memory. I found actually writing it out, instead of just pretending to with my finger, helped me remember it later. Hi, I came across your blog because I was trying to learn all the prefectures along with their Kanji. I found this really cool site by Paul Heaton Designs where you click on the prefecture and it shows you the Kanjis and its different meanings. I just studied this yesterday night and found myself really loving the way it was presented. It made it easier to remember them. I couldn’t help but laugh as I was reading through your post, all of your analogy and associations with the different Kanjis like ” Briar Castle” I immediately associated that too with Sleeping Beauty, etc. So now I am making myself a little card so I can remember all of them. I am so glad you shared this. Like you a lot of my friends don’t understand why I need to study Kanjis, nevertheless I will be aiming high and try to learn all Kanjis as soon as this year is through.